Elections don't matter for your investments in the long run. Sure, election results matter - but only in the near term. In 2004 when the BJP-led NDA coalition lost the elections in a shock result, the BSE-30 Index collapsed from 5,358 on May 12, 2004 to 4,961 on May 21, 2004, a loss of -7.4 % in 7 days. When the UPA-2 was reelected by a wider-than-expected majority in the May, 2009 elections the stock markets surged by +17.2% in one day on May 18, 2009. Trading was halted three times that day as the market hit 3 upper-limit circuit breakers during that truncated trading day. There was less than 90 seconds of actual trading on that day! On May 16, 2014 as the BJP's historic victory under Narendra Modi was being reported, the market surged to a strong opening and finally closed with a gain of +1.1%. So, yes, election results can move markets but elections don't impact your portfolio over the long run. 5.2% during the July 1991 to May 1996 rule of the Congress government under Narasimha Rao. When the 7 coalitions were in power, the Indian economy grew by more than the growth rate achieved by the 3 single-party governments for 6 of the 7 coalition governments. One can argue that the Modi-led BJP government is a single-party government and not a coalition government: it fought the 2014 elections as a collation with many partners but, because the BJP won a majority of seats on its own, it did not need any of its pre-election partners to form the government. Indeed, none of its pre-election coalition partners has any seats in the Cabinet. So, while showing up as a "coalition" government, it is in fact a "single-party" government. The rate of growth in the economy under the Modi government is reported as 7.4% per annum. But this is based on a new series of data which is mired in controversy. There is no guidance from the government on how this new data compares with the older data series from 1980 to 2014. Most economists deduct 1.5% from this new data series to equate it to the data under the old series. This means that the economy has probably grown by 5.9% under the Modi regime. This is lower than the long term average of 6.3% - giving further "proof" that single-party governments deliver rates of growth that are sub-par and below the long term average! So, in the end, it seems that 4 out of 4 single-party governments delivered lower economic growth than the long term average of 6.3% per annum and 3 out of 6 coalitions delivered a higher rate of economic growth than the long term average of 6.3% per annum. 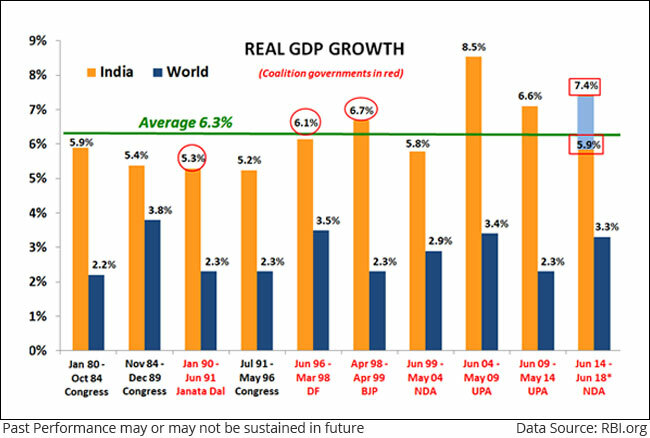 One possible explanation for this higher growth rate under a coalition government could be that, when India is ruled by single-party governments, those governments have the power and the time to trouble us and come out with harmful policies. When there is a coalition, the governments are so busy fighting with each other over what Cabinet seats to allot to each coalition partner that they leave us alone and we grow faster! having a coalition government is probably a better outcome than having a single-party government! The rate of growth in the global economy (the blue bars) does not really impact what happens in India. This is because, although India is increasingly plugged in to the world in terms of the flow of goods, of people, and of money - the real story in India is the domestic consumption patterns. India is Bharat! 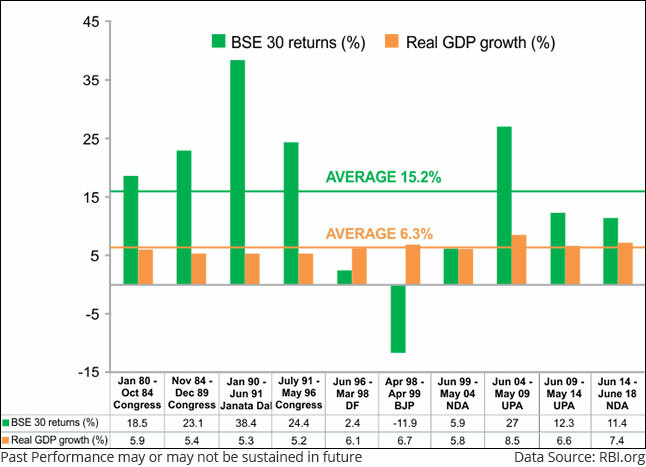 How higher GDP led to higher stock market returns! So, while this is all about the rate of growth in the economy, what does the data on the stock markets and returns from being an investor in the BSE-30 Index tell us? Well, the BSE-30 Index was 118 on January 1, 1980. As of December 31, 2018 it was 36,068. We noted above that the economy, over that similar time period, has grown from 100 in 1980 to about 11,000 today (adding in inflation which includes the impact of rising prices) - so an increase of 110x. The returns of the BSE-30 Index are completely independent of which kind of government is in power! The highest returns from the BSE-30 Index are under coalition governments - and the lowest returns are also under coalition governments. But it is also true that under 3 of the 4 single party governments, the rate of return from an investment in the BSE-30 Index has grown more than the 39-year average of 19.3%. Chart 2: Proof that Elections Do Not Really Matter while investing in Equities! There is one simple message in the chart above. The BSE-30 Index has grown a whopping 305 times over the last 39 odd years, creating wealth for those who wisely invest in the stock markets and remain invested for the long term - irrespective of the short term volatility that is the hallmark of any financial market. What Changes at Quantum Mutual Fund if the Government Changes? The equity team at Quantum and our equity fund managers firmly believe that India is a long term growth story and continue to pick stocks using the deliberate investment philosophy that we have built at Quantum - irrespective of who is in power. We continue to seek the best companies to invest your savings in, so that you can build wealth and meet your financial goals with confidence. While nothing changes for us at Quantum, we do realize that these elections could be one of the most closely fought in recent times - and the election results may have an immediate impact on the stock markets. For the next 3 months - all that we will talk about in India will be the elections. While getting caught up with the election frenzy and listening to multiple people, many of you will be worried about what will happen to your investments in equity mutual funds, in gold, and in liquid funds (a passive retail investor should NEVER buy a debt fund, in our opinion). Given the past data and our analysis of the impact of elections and governments on the growth rate of the Indian economy, Quantum firmly believes that elections do not matter when it comes to investing in stock markets. However, if election results do worry you and you are wondering how to allocate your investments then we have a one click solution for that too. So go ahead and make your allocations based on your expected outcome, you can curl up in front of your favourite noisy TV channel and watch the election tamasha! Yes, Quantum, I believe that the BJP-led coalition will win so let me buy your suggested basket of mutual funds in one easy click. Yes, Quantum, I believe that the Congress-led coalition will win so let me buy your suggested basket of mutual funds in one easy click. Yes, Quantum, I believe that the Mahaghatbandhan-led coalition will win so let me buy your suggested basket of mutual funds in one easy click.